Formula One driver Lewis Hamilton won the Chinese Grand Prix Sunday, but anti-sexism advocates say his victory is marred by major skid marks. 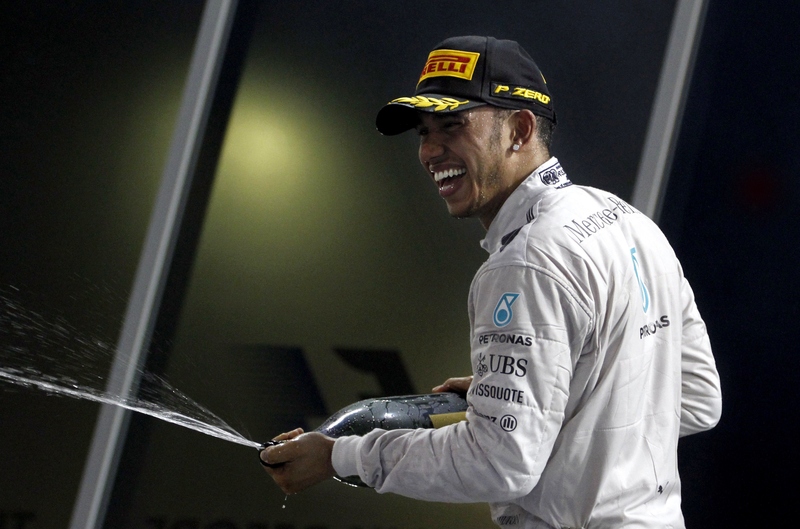 While he stood at the top of the Shanghai podium, Hamilton sprayed champagne directly into a hostess' face. No, it wasn't that she happened to be in an open splash zone. Hamilton pointed the bottle straight at her face. Photos of the offensive act have widely circulated online and have stirred questions over sexism within the racing world. The Chinese hostess looks completely unenthused as Hamilton, a longtime on-and-off boyfriend of Pussycat Dolls singer Nicole Scherzinger, holds an open champagne bottle aimed squarely at her head. This is reportedly the second time Hamilton has sprayed a hostess' face with champagne this season, according to The Sydney Morning Herald. The photographs appear to show that the woman is not just being splashed, but that the champagne is being very specifically directed into her face, which does not look like a voluntary piece of horseplay on her part. ... It is surely a very difficult position to be a grid girl and she would have had little option but to stand there and take it. That is something of which he should be aware. But instead, he appears to have abused her position. Hamilton's camp has yet to respond to the criticism. Now, champion champagne celebrations are pretty standard in the sports world, and no one is looking to take away from the party. But it's one thing to spray yourself, your team, or your crew. It's quite another to walk up to a girl and unload your party juice right in her face.